I’ve recently discovered that I really like the MCM style of furniture and home decor. I think it’s the clean lines and somewhat retro vibe that I love so much. Luckily, our house was built in 1968 and fits squarely in the MCM era. Slowly, Dan and I have been collecting MCM pieces – some originals, like this coffee table (which we finally re-did – more to come on it in a later post), and some that just look like it would be from the era, like the blue velvet side chair in our living room. We inherited my grandparents’ sidebar a few weeks ago, and eagerly put it in place in our dining room. 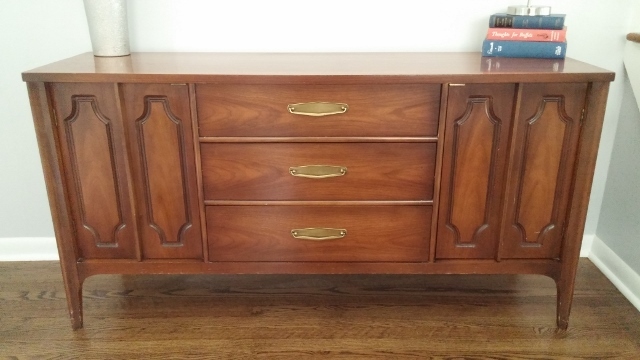 A gorgeous vintage piece, but on further inspection, I noticed it had some dings that showed its age. I it had a few too many encounters with a vacuum. To spiff it up a bit, Dan and I decided to try our hand at updating the piece. 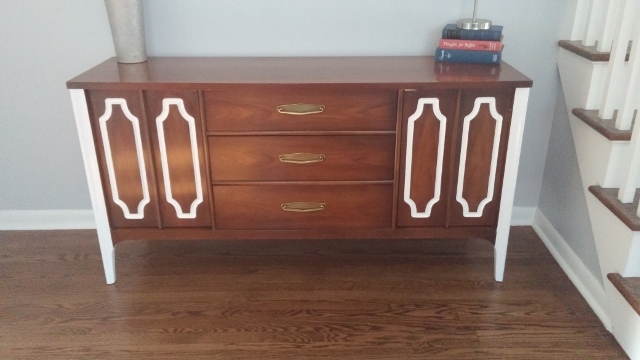 I’ve seen furniture from the 70’s partially painted on many blogs and on pinterest, and I thought some bright white paint would really bring new life to it. We decided to paint only the legs and the cutout in the doors. These were the parts of the sidebar that showed the most wear. White paint should fix that right up! I sanded the surfaces we wanted to paint (so the paint would stick better) and Dan taped the sidebar so he could use spray paint. The doors had to be removed and painted by hand. After three coats a piece, Dan sprayed sealer on the sidebar legs, just because we knew they would get bumped and didn’t want them to chip. We let the sealer cure for the recommended time period (it said it on the can), and then we put this beauty in its spot. I haven’t had time to style it, but I think our small update was a great improvement. I love that this piece was from my grandparents’ house, where I spent a lot of time as a kid. The update makes it feel more like our style, and brought it into this decade. We made it our own, while preserving the piece itself. We thought about painting the drawers, painting/changing the hardware, or maybe painting a stripe or two, but I think we’ll take a wait and see approach on that. We started with the “less is more” concept, but we can easily paint the drawers later if it strikes our fancy. What do you think? Stripes? No stripes? Something completely different? And while we’re at it, how would you decorate the piece? All comments/advice welcome.